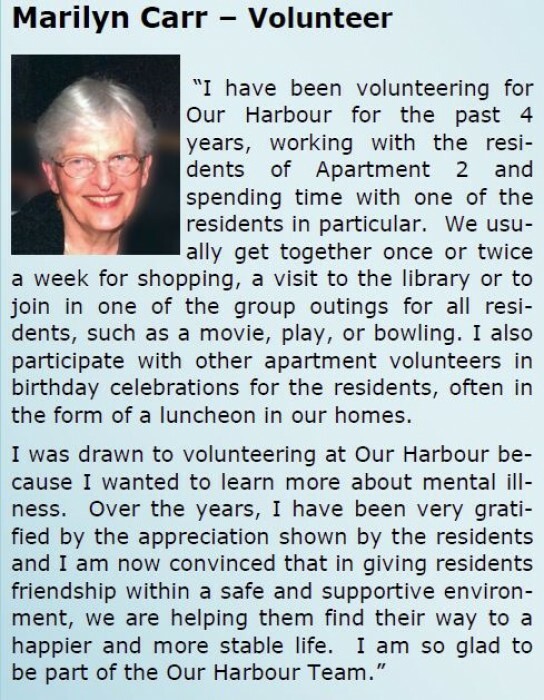 Our Harbour celebrates the volunteers so essential to our operation. This year we held a Volunteer Appreciation Luncheon. They all offer links with the community at large. They generally donate 1 or 2 hours per week and participate in group activities. Volunteers are being sought for a variety of tasks. Volunteers typically visit regularly with the residents, perhaps inviting them for coffee or sharing a favorite activity with them. In some cases, volunteers support them in honing daily living skills with the view of helping them to become more self-sufficient and better integrated into the community. Volunteering could also include driving residents to appointments, or accompanying them on group outings. 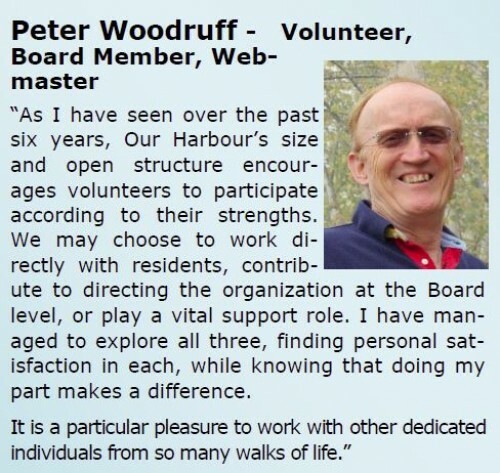 Volunteers are needed for other tasks more of an administrative nature, including fund-raising, outreach to the community, editing publications and sitting on the Board of Directors. As a long-time board member of OH, I can say that it has brought me into contact with some extremely interesting people who share my values, who live for causes in which they believe without necessarily being affected personally or indirectly but in which they consider worthy causes in themselves. I have established a close relationship with several of these individuals and count them among my truest friends. My understanding of the St.-Lambert community has thus expanded through this heterogeneous group of local people united in a common pursuit. My involvement as an apartment has also broadened my knowledge of mental illness (and the related stigmas) and a greater understanding of and compassion for its victims. I am privileged to be considered a friend by our residents who all offer me affection and gratitude and confide many of their deep feelings to me. We get together for the simple reason that we enjoy each other’s company and benefit from the encounters. They represent a whole world I knew very little about but in which I now perceive such richness- they have a good sense of humour, compassion for others, generosity and, in many cases, artistic talents that amaze me. In sum, I feel blessed to be a volunteer and board member of OH.